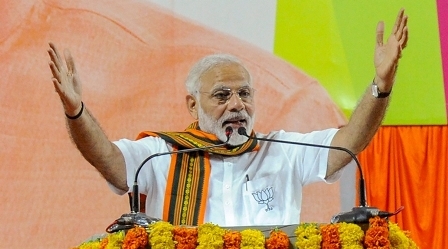 NEW DELHI: Prime Minister Narendra Modi on Monday rejected the Congress' charges against the government for not creating enough jobs for the unemployed in the country and claimed several of its initiatives resulted in the growth of jobs in the public, private and personal sectors. Modi made the remarks while addressing the BJP Yuva Morcha karyakartas through his NaMo App. "With emphasis on public and private sector, we are also focussing on personal sector for employment. The pace of work on infrastructure projects has been increased," Modi said in response of a query by a BJP cadre. He said due to the initiatives of the government, India has emerged as the best destination for foreign investment and this has been approved by various credit agencies. "The Foreign Direct Investment (FDI) in India has reached its highest level which is consistently increasing," he said. The Prime Minister said that under the Mudra Yojana, loans of Rs 1.27 crore have been disbursed to the youth of Karnataka without any collateral. "This constitutes 11 per cent of the total Mudra loans disbursed so far. Youngsters are not only becoming self dependent, but also creating jobs for others," he said. Modi also said that in the last few years, immense growth was seen in EPFO accounts. Dubbing Congress' criticism of the government on employment and job creation as conspiracy, he said the opposition party has been putting the blame on the BJP government because it failed to anything during its 10-year rule. "The Congress has nothing to say about its achievements. They ruled the country for 60 years and what did they do for employment generation. If there is employment, is that due to four years of our government. So, they find it easy to accuse us and spread lies," he said. Without going into facts, Modi said the Congress is spreading lies and hatching conspiracies to put the onus on the NDA government of its own failures. Terming employment generation the "biggest problem" in the country, Congress President Rahul Gandhi has been attacking the Centre for "not" fulfilling the promises of creating two crore employment every year which it had made in 2014. Responding to a query over rising incidents of political violence across the country, the Prime Minister said there can be no place for political violence in our democracy. "But off late, I have seen that such violence is on the rise in some of the states. In Karnataka too, we have seen how brutally our karyakartas have been murdered. Its highly condemnable. "Violence in any form should not be allowed by any political party or ideology in democracy and I appeal to BJP's youth karyakartas in Karnataka not to act in vengeance even when they have lost their several karyakartas in political violence," he added.